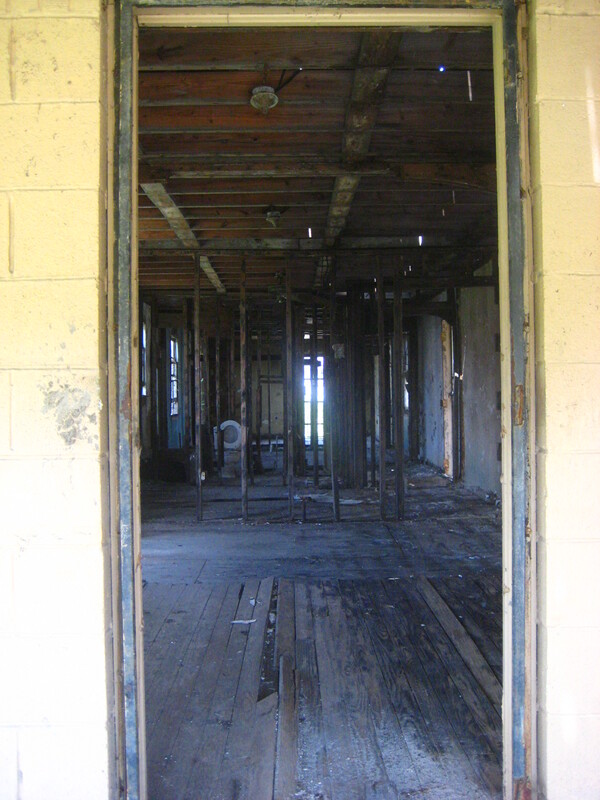 A gutted house interior on Flood Street (I’m sure I’m not the first to pick up on the awful irony). 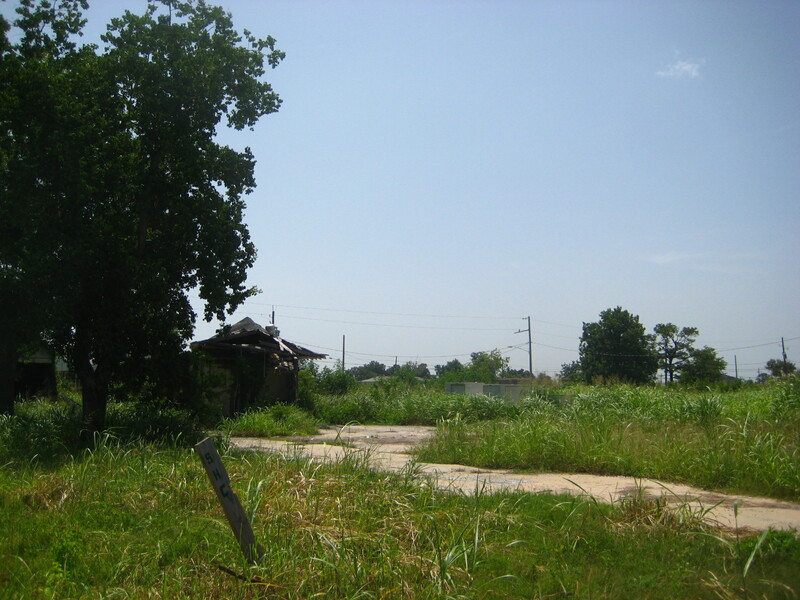 The Ninth Ward is mostly empty, just green spaces, a few houses, most of them empty, here and there. I had not been down into this part of New Orleans post-storm until last Saturday; I’d been in a neighborhood to the west last year, doing some work with Habitat for Humanity, but had never ventured across the canal until last week. 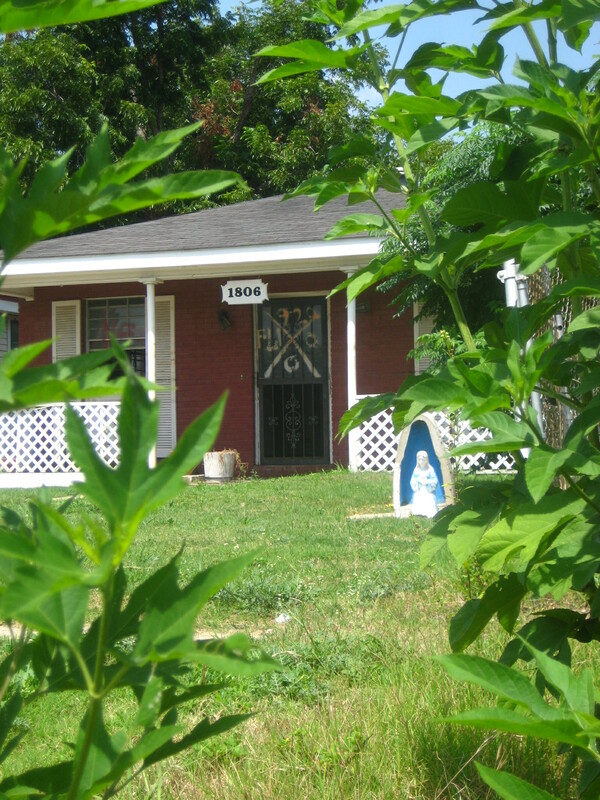 One of the few houses on the street that looked fixed back up; Our Lady is still keeping watch, anyway. 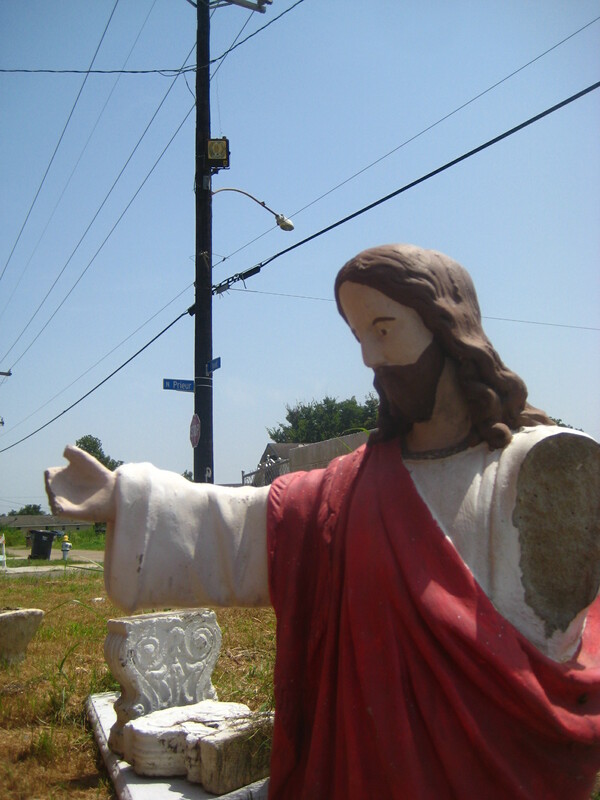 The front lawn of a washed-out little Catholic church. A little further west, towards the canal. This is the Deep South; the greenery is irrepressible, and devours everything in very little time if it’s given half the chance. Not the Ninth Ward this, but close enough. 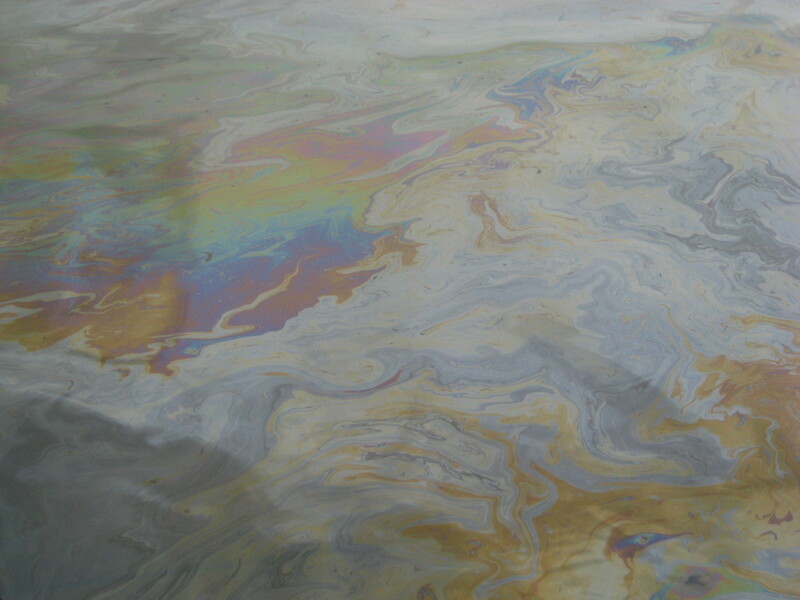 The oil spill was being mopped up Saturday, but was still bad enough to keep most of the river traffic bottled up. I took this photo from the landing opposite Jackson Square. ‘Where?’ He was somewhat non-committal, merely pointing down the road. Well. I had read in the guidebook that lodging was available here, but, like my football playing informer, the description was non-committal. I walked out of the streetlight, waved to some men standing in front of a little store, probably nearing closing. I smiled- I have always hated to look like a lost, clueless tourist. My goal is to beam confidence, a knowing surety, as if I have anything to lose by appearing a little flustered in front of people thousands of miles from my home who could really care less about my traveler’s pride. 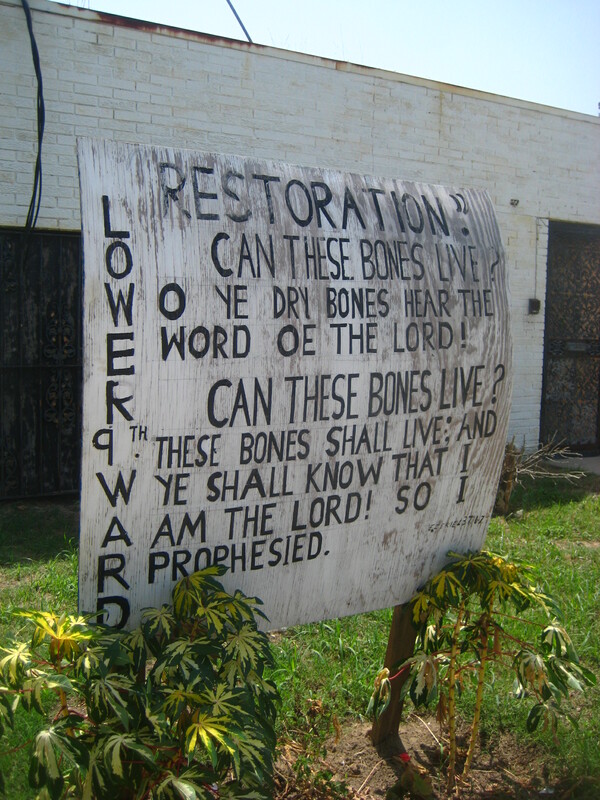 I followed a series of signs that promised lodging. I was bone-tired, dreading each further step. I was beginning to loathe the town, the night, myself, my inept decisions of the day. In several of the little villages I had passed through people had offered me a place to stay for the night. One of the villages was a particularly beautiful oasis, the village running along the rim of the canyon, the desert above, green lush sward below down to the river; at the north end of the village a huge wall of stone dropped from the mountains down to the river, only a narrow notch allowing the river and a sliver of road to continue north to the Atlas. Across the valley from the road the village stretched on, and in the centre was a crisply painted white minaret, stark against the mud brick of the kasbahs. The cultivated part was glowing with fruit trees in bloom. It was paradise. I had passed a sort of pension where the proprietoress had hailed me and suggested I spend the night. No, no, I said, I’m heading for Anemetir. She looked incredulous. Too far- stay here! No, no, I said smiling, I must go on. She shook her head and said goodbye. Some kids followed me for a ways, laughing and talking. One little girl asked me if I was from Egypt, and I took it as a decent appraisal of my Arabic, or her lack of knowledge of things Egyptian. Eight-thirty at night in mostly dark Anemetir I was severerly wishing I had stayed in the paradisical village. But no- I wanted to get transportation out on Sunday, make Marrakesh, and, dutiful student always, be back in class on Monday. Right now though I was contemplating sleeping under a rock, in the cold. I found the advertised hotel. There were no lights on. I knocked and knocked on the big, prison looking wooden door. Nothing. Place was closed as a tomb. I dithered back down the path, wondering what I was going to do next. I climbed down a little valley, past another late-night store, an oasis of warm, gentle light and domesticity, while the rest of the town seemed to have receded into the threatening desert, cold, dead, dark. I continued on the road north. I knew there was another town seven or eight miles on, with a couple of for-sure hotels. Or I could knock on someone’s door and take my chances. I was passing the last streetlight in the village, the open road and open country stretching in front. My heart sank; I felt sick. Interiorily I was cursing myself for such an idiotic enterprise. I had neither tent nor sleeping bag, only my paltry pack with a little food and some extra clothes. It was getting cold out, the wind whipping down from the snowfields of the High Atlas. Then, as if my troubles couldn’t get any bleaker and more pathetic, a pack of dogs started barking at me and threatening with their barred teeth. I started to stoop for stones; it wasn’t the first time I had been forced to ward off angry dogs. But before I had to do anything else, a man with a flashlight- a headlamp at that, of all things- yelled at the foul creatures and they snarled away. I waved, and he asked- in English, if I recall correctly- if I needed help. Indeed I did- did he know of a hotel, gite, anything? Yes in fact- and he shined his light across to an odd-looking place: Chez Mohammed’s Gite Camping Berbere, the sign proclaimed. My anonymous guide knocked on the door of the little compound, and after a bit Si Mohammed appeared. My guide explained my predicament, and Si Mohammed agreed to put me up. He led me into a sort of dining room, with tables down the middle and couches around the sides, which I supposed were used to cater tourists during the on-season. He also had some big Berber style tents for use in warmer weather. That night however I was the sole customer. I looked pretty horrible no doubt, and Si Mohammed seemed genuinely concerned. I tried to explain my adventure so far in a pidgin of Arabic and my meager stock of French. After making me a bed on one of the couches, and running his cat out of the room, he shuffled back to his kitchen and cooked me dinner. It was quite possibly the most wonderful meal I have ever eaten. After eating I laid down in my bed, my whole body shivering with exhausation, my legs aching like fire. I had a vision of myself waking up deathly ill, stuck in Anemetir, my money running precariously low, and no ATM in sight. My vision didn’t last long, however, as I quickly fell asleep. I woke up and felt- al-hamdu’lillah– wonderful, completely refreshed. My aches and chills were gone. I groggily walked out to the bathroom, put in my contacts, washed up as best I could. After packing my things and eating a bit of breakfast from my pack, I knocked on Si Mohammed’s door and said good morning. He had explained to me the evening before that a grand taxi would be leaving from Anemetir in the morning, and I was going to make sure I made it out. We looked out but the taxi hadn’t pulled up yet; it waited at the edge of town, across the little valley from Si Mohammed’s. While I waited he invited me back to his little room to watch al-Jazeera. So for a while I took in the weekend’s news, or at least the bits I could comprehend from my limited vocabulary and the power of images. Eventually the taxi arrived, and I paid my bill, which was quite low. Not that I cared a lot- I would have paid considerably more, seldom having appreciated a roof and bed more. After saying a heartfelt thank-you and good-bye to Si Mohammed- who seemed to wish I could stay longer and hang out- I walked out to the taxi. I was the only person waiting at the moment. I said hello, talked for a minute to the driver, then sat down in the back seat. And I waited. I thought about going back to Si Mohammed’s place to catch some more al-Jazeera, but I feared a sudden influx of customers and the taxi leaving without me. Of course, no such thing was likely to happen, but I was eager to get on with my journey, and not wait around Anemetir for another night. Over the next hour passengers trickled in, and we were soon on our way. The engine of the old Mercedes Benz complained and coughed, but started after some encouragement, and we rolled through the barren salt wastes that line the dry riverbed of the appropriately named Nahr al-Mellah above Anemetir. After some elevation gain, however, the scenery changes, becoming gradually greener, pine trees appearing on the slopes, and soon the snowy peaks of the Atlas emerge. We ended our journey in Telouet, the former home of the infamous Glaoui chieftans. We drove past their massive, sprawling kasbah at the edge of Telouet, its rotting hulk looming against the mountains distant. The taxi driver asked if I wanted to stop at the ruins, but I said no, I need to keep going. We piled out in the dusty little main square of Telouet, and as soon as I stepped out the bitter cold wind hit. It seemed a world away from Anemetir. I made for another grand taxi, which was supposed to make for Marrakesh. I stuck my bag inside, then went by one of the little stores and bought some sweets, then walked up the street to snap a photo of the great Kasbah. The wind ate into my inadequate clothes, and I beat a quick retreat for the taxi. When I had arrived, several men were sitting inside. I assumed they were going to Marrakesh. They weren’t. After about thirty minutes, the driver informed me I was the only passenger, which meant a trip to Marrakesh would be in the hundreds of dirham. I balked; there was no way I would or even could pay that. 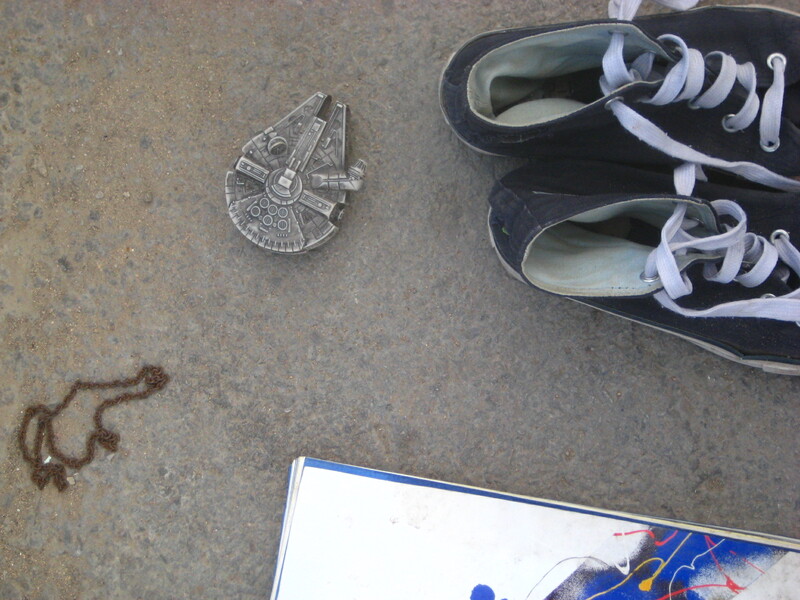 I looked around; down the street was a blue van, its flat snout pointing down the road towards, roughly, my goal. I climbed out of the taxi and started walking for the van; my walk became a run when I saw the vehicle start moving. I ran up to the driver’s window and asked if he was going towards Marrakesh. He laughed but nodded; I took that as an affirmative, and climbed into the van, which was packed with local men heading for work higher up in the mountains. I salaamed to everyone and did my best to look calm and nonchalant, like this was something I did everyday. We started off- or rather, one of the men jumped out, pushed the van down an incline until it started, then ran and climbed back in. The road wound its way higher and higher; we stopped from time to time to drop a man off at his field or herd. At last we rounded one last incline and reached the main highway between Ouarzazate and Marrakesh. And that was the end of the van’s route. We were deposited at a sort of café-garage. I went inside and had some mint tea, then went out and stood by the highway alongside a couple of young Moroccan men. We started work at hitching a ride. It was not fun work. The snowfields were only another thousand feet or so above us at this elevation, near the very top of the highway, and the cold was bitter. I took a break from hitching and joined a little group of mechanics warming their hands over a fire next to an old Volkswagen being disemboweled. After regaining a little warmth I returned to my task. No one stopped. The buses- which were frequent enough- simply frowned and motioned that they couldn’t stop. All the grand taxis were full. I was beginning to feel a little jazzed out, to say the least. I stood alongside the young Moroccan men and we shifted back and forth in the wind, extending our hands from time to time at passing cars. Finally a lumbering grand taxi pulled up and stopped. I ran to the driver and asked if I could get a ride to Marrakesh. Yes, he said, and told me the price, which sounded about right. Not that my options were very great. I climbed- literally- into the hulking extended body Mercedes Benz, already packed with travelers. I squeezed in and we were off. I breathed a prayer of thanks. The taxi scooted around the curves, dodged tour buses, and spluttered and coughed up the pass, then down towards Marrakesh. A mile or so below the main pass the taxi suddenly died. We stopped, in the middle of the road. Behind us- blind curves, buses hurtling down the mountain, break-neck. I imagined what it would be like to be flung off the highway and down a thousand foot cliff. I wondered whether I would make CNN, and figured no, I was just one American, not a very big deal. Now a taxi-load of Americans… The driver was cursing and kicking at the car. I laughed and said, “Miskeena– the car’s sick!” My fellow travelers laughed with me. The driver climbed back in, turned the ignition, and the car mercifully woke back to life. We made it all the way down, past the Berber towns clinging to the valleys, down into the cedar forests, down onto the plains, almost to our destination in a town just outside of Marrakesh. But a mile from the taxi stand our poor vehicle died again. It was several minutes before she finally restarted, and we pulled up the taxi stand and piled out. Nobody could complain of being cold by then. A grand taxi stuffed with nine men hardly needs a heater. From there it was an easy municipal bus ride to Marrakesh, and then a petit taxi to the train station. I was in and out of Marrakesh, not having time to see the famed Djama’ al-Fana or anything. I got my train ticket, which expended nearly all the dirham I had left in my pocket, then wandered down to a food stall on the street, walked to the National Theatre and back to the station. Once I boarded my train the journey was straight-forward. I sat next to a pretty British girl who had been on a two-week holiday in Morocco; we talked for a while about our different experiences of the country, which she had visited once before. She got off at Casa, and after that I chatted with a Moroccan couple and picked up some new Arabic words; after they got off an elderly lady sat opposite me. She was thrilled by my Arabic, and shared her basket of fresh fruit with me. I went to sleep, and woke up outside of Meknes; while coming back from the bathroom I happened across some English-speaking German students who were staying in Fes and seemed rather worried about getting to their hotel. I tried to help them out, gave them my cell phone number in case they needed help, and felt very proud indeed at my local knowledge. When we pulled up to Fes I got off the train with them and negotiated a decent price at the taxi stand and waved them good luck. It was one or two o’clock in the morning, and I was more than a little tired as I dragged my feet back across the Ville Nouvelle to my little room, where I collapsed and slept soundly, but woke in time for- ever the dutiful student- my morning class. 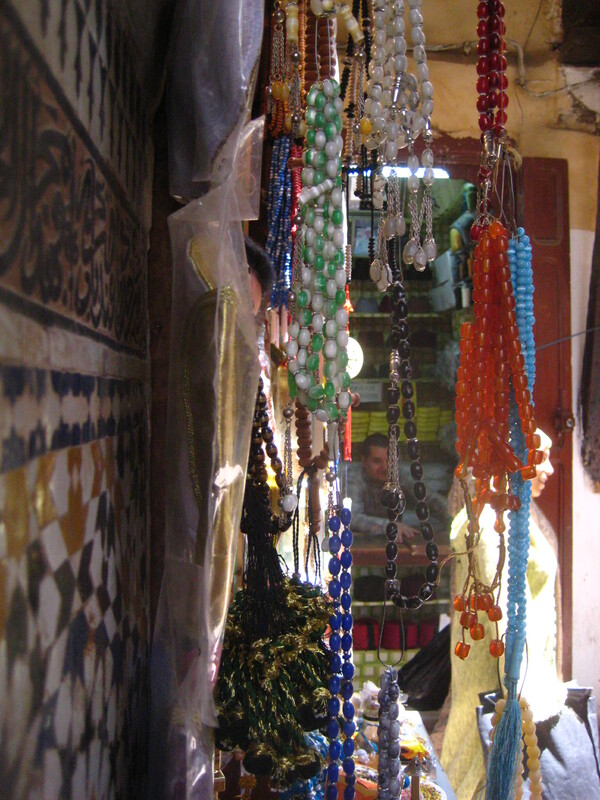 These are rosaries for sell outside of the shrine of Moulay Idriss II, the founder and (current) patron saint of Fes. The haram-precinct surrounding the shrine is filled with small shops selling rosaries, incense, candles, and other devotional aids, as well as sweet-meats (Idriss being the patron of sweet meats as well as the city, apparently). 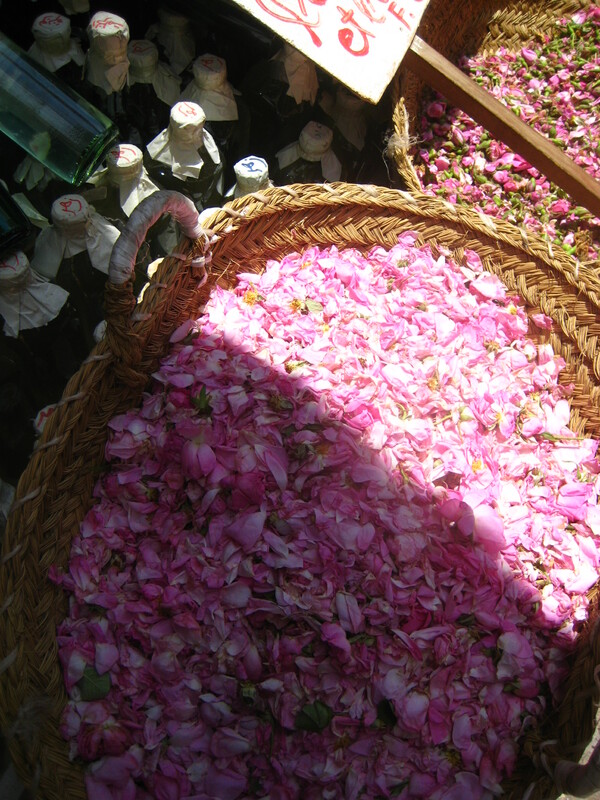 The rose-petal and rose-water vendor down Tella Kabira, just below the meat-sellers quarter. The olfactory contrast is intense. 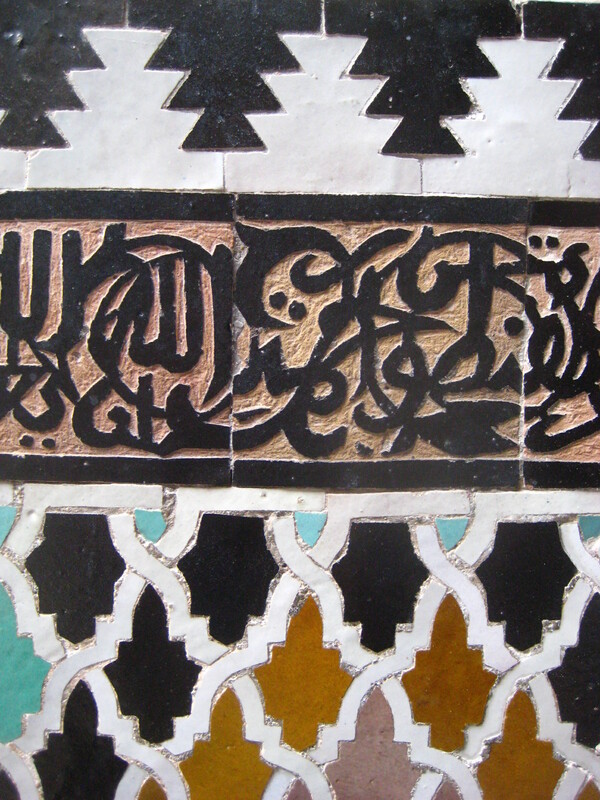 Zellij tile and calligraphy in a medrasa in the Andalusian quarter. 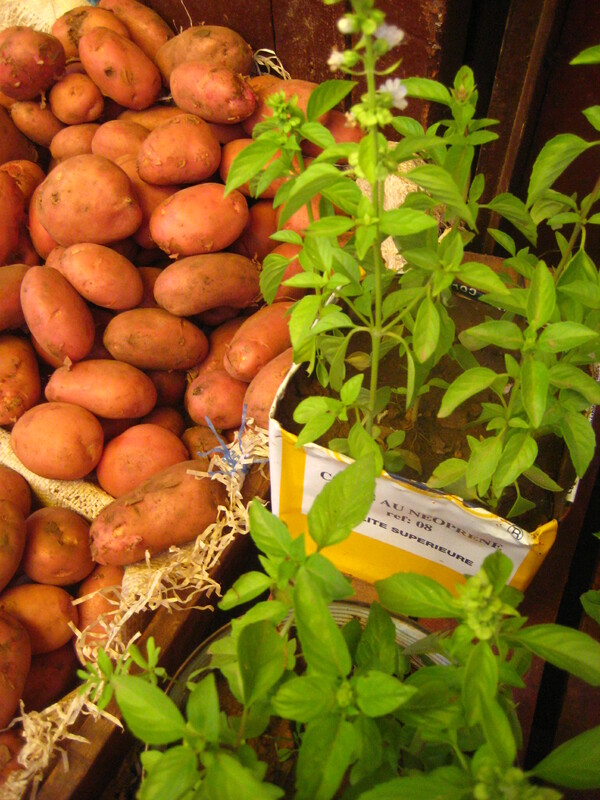 Potatoes and herbs on or near Zanqa Romain. 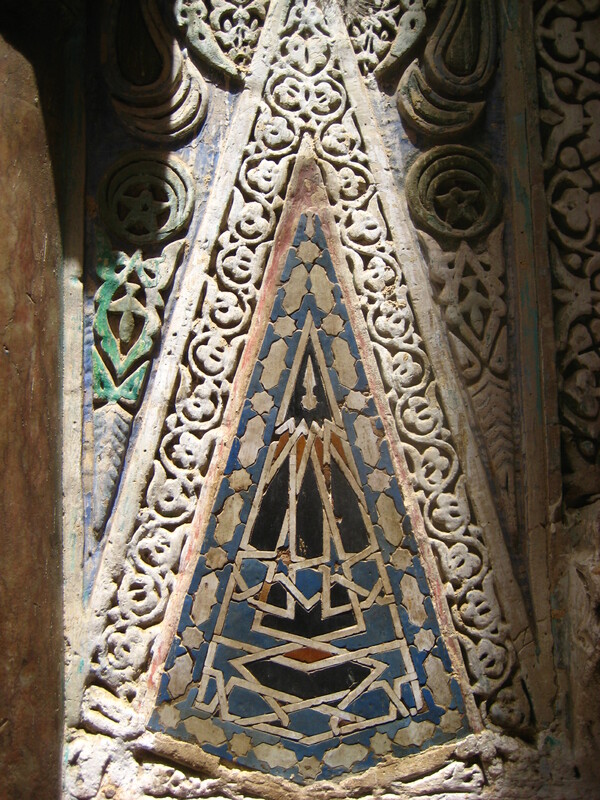 An interesting piece of decoration of the exterior of the Moulay Idriss shrine. I’m afraid I have no idea of its symbolic import- assuming it has some- so if perchance anyone out there knows, I’d love to be filled in.